The purpose of the modeling project was to spatialize information and theories about how the Forum looked at this moment in time, which was more or less the height of its development as Rome’s civic and cultural center. 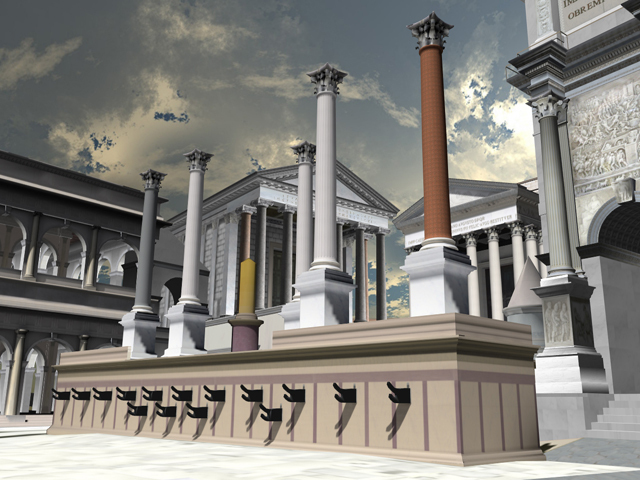 The digital model includes over twenty features (buildings and major monuments) filling up the western zone of the Roman Forum from the Temple of Vesta and Temple of Antoninus and Faustina on the east to the Tabularium facing the western slope of the Capitoline Hill. Thanks to archaeological campaigns that started in the early nineteenth century and which continue to the present day, these features can be seen in Rome today and constitute one of the city’s most important archaeological sites. Their state of preservation varies from fair to poor; and the ruins seen today represent a mixture of different phases in the life of the Forum. As a result, understanding the Forum is a challenging task not only for tourists but also for scholars. Almost as soon as the new excavations started bringing the ancient remains to light, archaeologists such as Canina, Huelsen, Gatteschi, and Gismondi started to create graphic and physical reconstructions of how the Forum might have looked at specific moments in time. The CVRLab digital model, created with the help of an international Scientific Advisory Committee, is the latest example of this perennial project.